Announcing the winners of the 28th ever Right Place Photo Caption Contest! Presenting the top fifteen captions for this picture from REUTERS/Larry Downing via Yahoo! #15: President Bush announces the new United Nations official logo. #14: I'm happy to be here at the unveiling of President Chirac's official portrait. #13: Presidential portraits: William Jefferson Clinton, and George W. Bush. #12: Democrats abandon all pretense of civilized discourse and go for the "seltzer-down-the-pants" gambit. #11: "Clowns to the left of me, jokers to the right. Here I am, stuck in the middle with you." #10: Since CNN got away with blasting an "X" over Vice President Cheney's face, they've become far more bold. #9: Why all the funnery? Dean said he had my portait ready and I demand to see it! #8: I guess they DO have pictures showing Bush and Abramoff together! 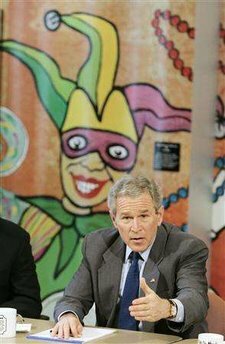 #7: President Bush and Mayor Nagin discuss important issues facing New Orleans. #6: "It's tough getting down to serious business with Dr. Dean looking over your shoulder." #5: Democrats continue their disastrous policy of not taking George Bush seriously. #4: Some ex-presidents go on speaking tours after office. If ours wants to host "Jokers Wild", so be it. #3: Moonbattomiraphobia: The fear that somewhere, somehow, Nancy Pelosi is staring at you. #2: "A Pepsi for me, and a Cask of Amontillado for Harry Reid." #1: "So, what do say about my Mardi-Gras-vitas?"